A new mission to the planet Mercury is designed to answer some 30-year-old mysteries about its scorched surface. On august 3, 2004, NASA launched the Mercury Surface, Space Environment, Geochemistry and Ranging (MESSENGER) experiment from the Cape Canaveral facility on a 7-year mission to study the solar system's innermost planet. 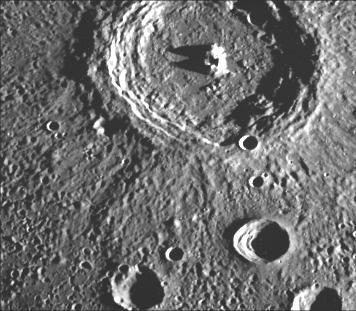 On January 14, 2008, MESSENGER performed an initial flyby of Mercury, coming within 200 kilometers of the torrid world. 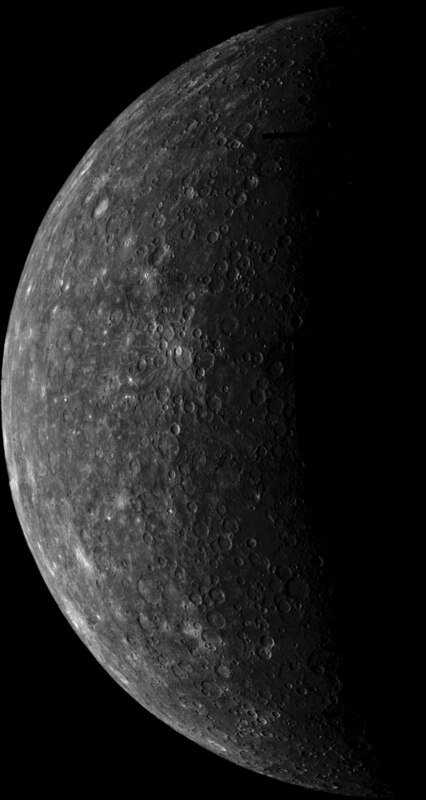 On March 8, 2011, MESSENGER will enter orbit around Mercury and begin a multi-year analysis of the surface, the magnetic field and the planet's core. Mercury, like most bodies in the solar system, has a weak magnetic field but research scientists have no idea how its being generated. 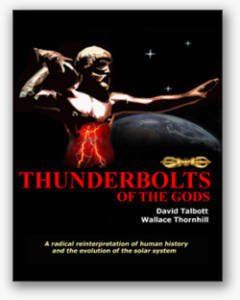 Earth has a strong field that helps to protect us from the sun's ionic bombardment, but Mercury has no such protection. It receives a continuous blast of radiation and atomic particles that is almost 1000 times greater than what is measured at the Earth's surface. A magnetometer on the satellite should help resolve where the magnetic field originates. Modern theories suggest that a rotating "dynamo" of molten metal exists inside Earth and that is how our magnetic field is created. Mercury is thought to have a molten core as well, but no one knows if it is working like Earth does or if the field is part of the crust, like Mars. No one understands how a molten core exists on Mercury since the planet appears cold and dead. The molten interior should have cooled off eons ago. The last spacecraft to explore Mercury was Mariner 10 during its tour of it and Venus. 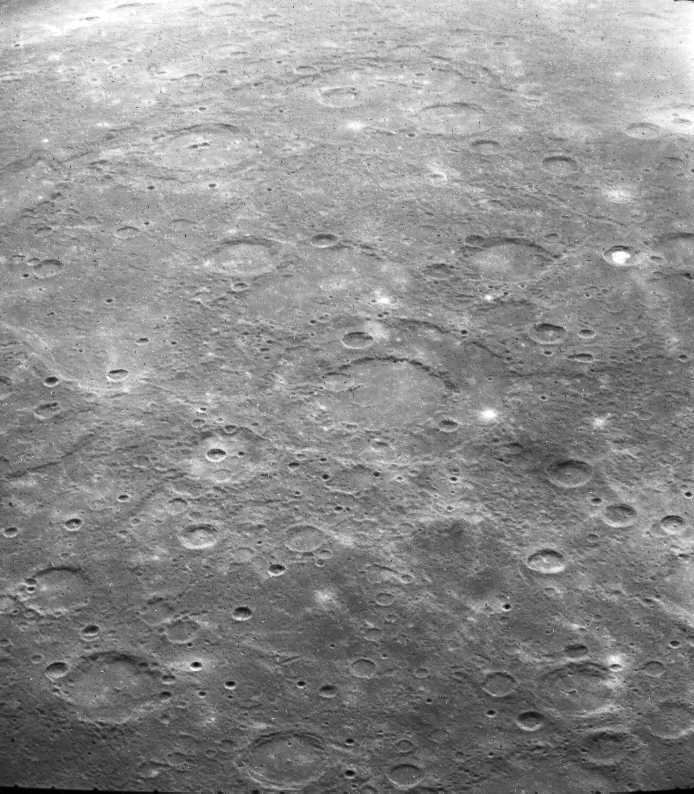 Mariner 10 flew near Mercury in 1974 - March 29, September 21 and then again on March 16, 1975. However, because there was no orbital insertion, only about 45% of the surface was revealed by the onboard instruments. Because MESSENGER is designed to orbit Mercury, mission specialists hope to find answers to other mysteries left unanswered for the last 34 years. Based on its calculated high density, Mercury is believed to be almost 75% iron surrounded by a thin shell of silicon-rich rock. 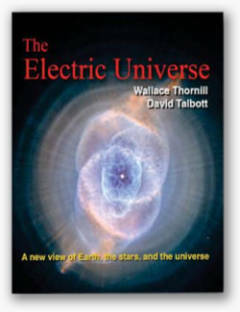 Conventional theories of planet formation have no explanation for such a configuration. If it formed in the same proto-planetary nebula as the rest of the solar system, say geophysicists, then the abundance of iron remains a conundrum because the ratio of iron to silicon is opposite to the other rocky planets. By interpreting the surface mineralogical signature of spectrographic data that MESSENGER will provide scientists hope to decide whether Mercury was overheated by the sun or was nearly shattered by an impact--either event removing most of the silicon from the developing planet. 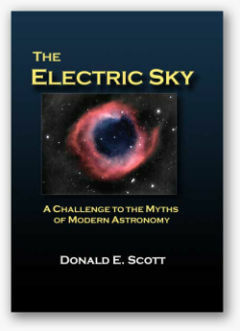 The Electric Universe provides a simple yet surprising answer to these mysteries in "Astronomical Myths of Mercury and the Sun." 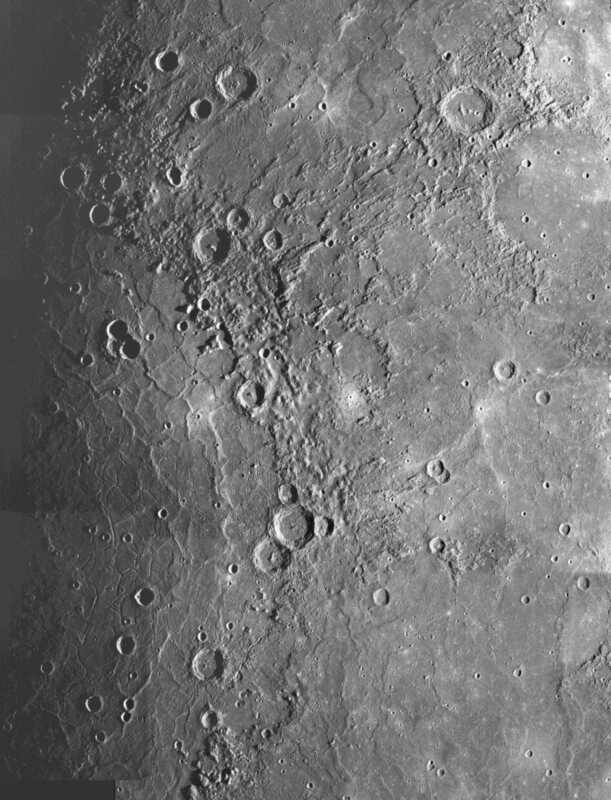 One of the most intriguing features on Mercury is the Caloris Basin, a 1300-kilometer "impact" blemish that supposedly caused shockwaves to pass entirely through the planet. On the opposite side of Mercury are bizarre folds and uplifts that are said to be from the antipodal compression of the crust as the tremendous pressure partially melted and then re-solidified the strata. The Caloris Basin resembles other multi-ringed "impact" structures we have previously discussed in other Picture of the Day articles. Shattered and chaotic landscape is only one aspect of Mercury's strange environment. There are sinuous rilles and cliff-faces that cut through craters. 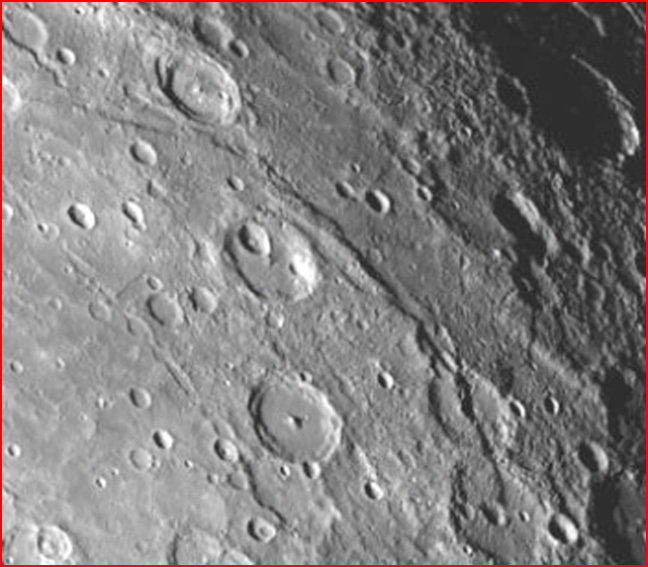 The craters are often hexagonal in shape, have flat-floors and central peaks or bumps. There is a marked lack of debris surrounding the craters, leaving open the question of what happened to the millions of tons of material that must have been blown out by meteorite explosions. Sinuous rilles, such as the Rupes Scarp, have long been considered by Electric Universe theorists to be evidence that electric arcs have struck planets. As MESSENGER gradually settles-in to its 2011 orbital observation more data should help to demonstrate that Mercury's structure and features could be the result of electrical activity on a enormous scale.